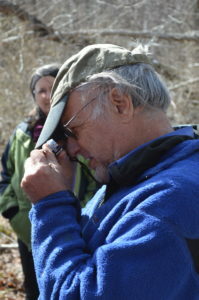 Ethnomycologist Larry Millman examining a fungus at East Farm in Kingston. What do you do when you’re being haunted by a recently deceased relative who doesn’t realize they’re dead? Or your camp is being invaded by a six-legged polar bear with a taste for human flesh? Or there’s a human-ish creature pulling a wagon load of disease headed your way? 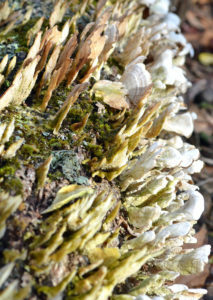 The answer to all is simple: fungi. 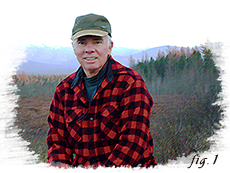 And ethnomycologist Larry Millman, who spent years in the northern parts of the world studying the uses and stories of fungi use, can tell you just which ones will work best. In Siberia, the native people say that if any of those events happen, they must call the shaman to beat a drum and burn the polypore, a type of mushroom. In that part of the world, the polypore would have been obtained through trade of whale meat and other goods, Millman said. 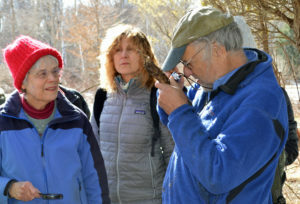 Millman recently led a fungus hunting walk and spoke at the Rhode Island Natural History Survey (www.rinhs.org) in Kingston. Fungus growing on a fallen piece of wood. 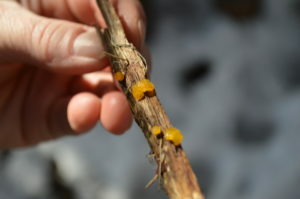 Millman said that fungi use an assortment of adaptations to survive in the harshest winter. 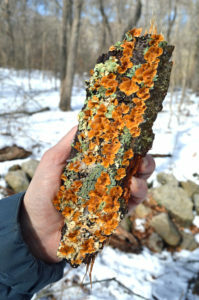 “They’ll often dehydrate when it’s cold and dry,” he said, pointing to lines of flaky looking turkey tail. “They’ll rehydrate when the temperatures and humidity levels rise.” One group member found a puffball mushroom. At this time of year, puffballs are hard and dry, but come spring and wetter, warmer weather, it may only take a good shower or hail to release its spores. Turkey Tails, dehydrated for winter. While mushrooms are part of the culture of the northern peoples, they are not often found on their dinner menu. “The central Canadian Inuit regard mushrooms as “anaq” of shooting stars and will not eat them.” (Anaq means… excrement.) “In late summer, there are shooting stars going across the skies. The next day, there are these mushrooms growing on the tundra. Where did these come from? 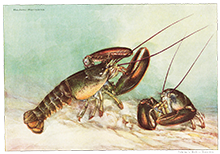 They are the anaq of the shooting stars!” And therefore, the people will not eat them. Millman illustrated another native use of fungi, discovered when Otzi, the 5,000-year-old mummified man, was found in 1922. “Otzi had two polypores on him: one was a tinder polypore; we assume that he was using it as a fire starter. The natives will take the polypore, dry it and pound it into a powder. They will use two pieces of quartzite to make a spark, the sparks fall on the powder, and it burns.” It can also be used as an insect smudge: the smoke produced by the smoldering fungi are an effective deterrent against biting insects. 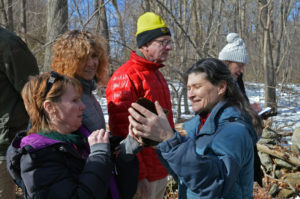 RINHS’s Kira Stillwell (in blue) shows a fungus to walk attendees. As always-very interesting!! And I agree with the Canadian Inuit-I don’t eat anaq either! I think I’d pass on that as well. Store bought shrooms for me! Great to read since I missed the walk and talk. It is a fascinating subject. Fungi are an interesting lot. Thanks for recapping the day. I’m delighted that you enjoyed it! Fungi are quite fascinating indeed.